Located steps from the Opera House in Hanoï's French Quarter this legendary property brings guests into intimate contact with the opulence of another era. 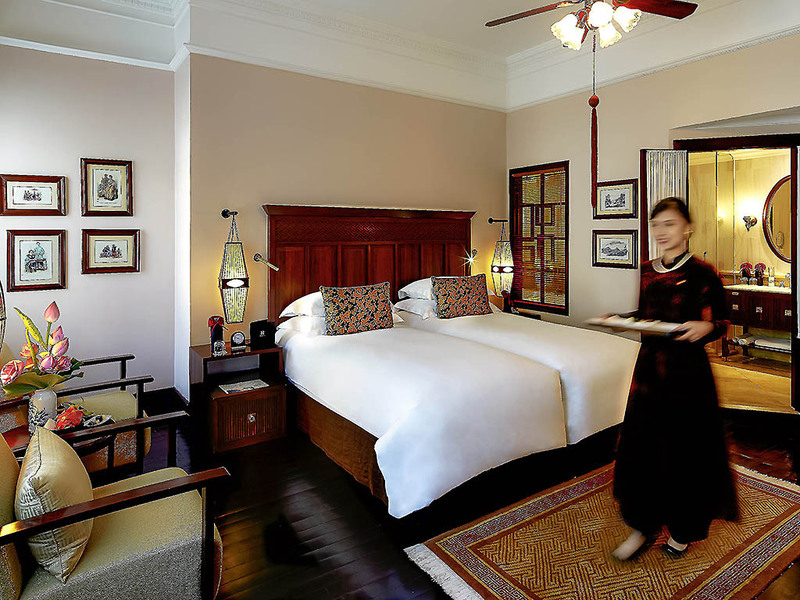 Surround yourself in heritage as you stroll stately corridors and explore a dramatic past. 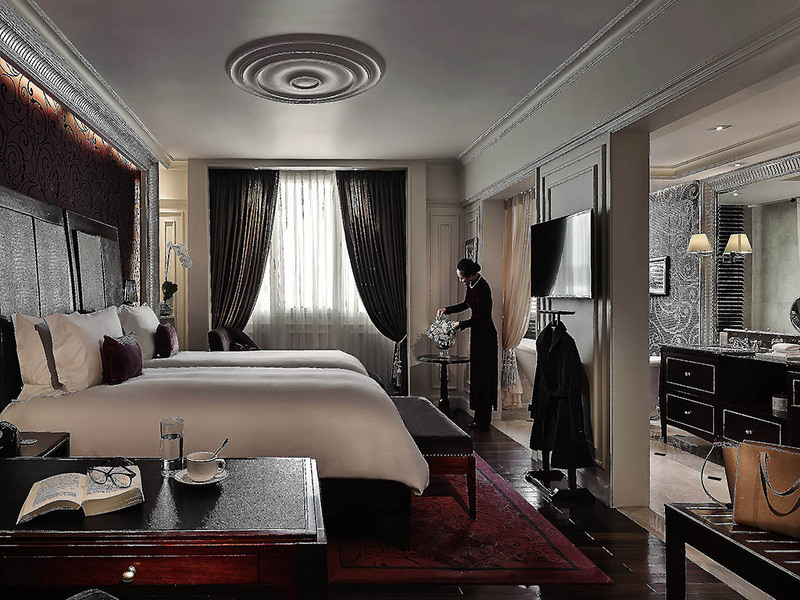 Sofitel Legend Metropole Hanoi first opened in 1901 having been designed and built by two French investors. 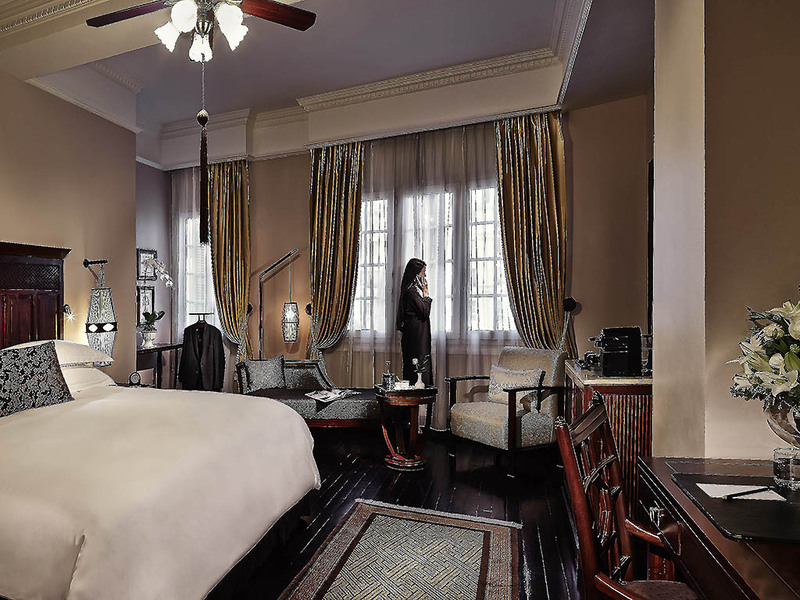 Standing the test of time, the hotel is recognized as Hanoi's legendary landmark for its contribution to the city's heritage. Charlie Chaplin, Graham Greene, Somerset Maugham are just a few. From Noi Bai airport via Thang Long Highway, over Thang Long bridge turn left at the roundabout to Phu Thuong Rd, onto Au Co St, continue towards Tran Quang Khai St. Turn right to Trang Tien St, the hotel is located 100 m from the Opera House. The hotel offers a limousine service by BMW 7 Series with its latest in-car technologies (DVD player, Ipod, WiFi). Reservation in advance is required (via email H1555@sofitel.com). 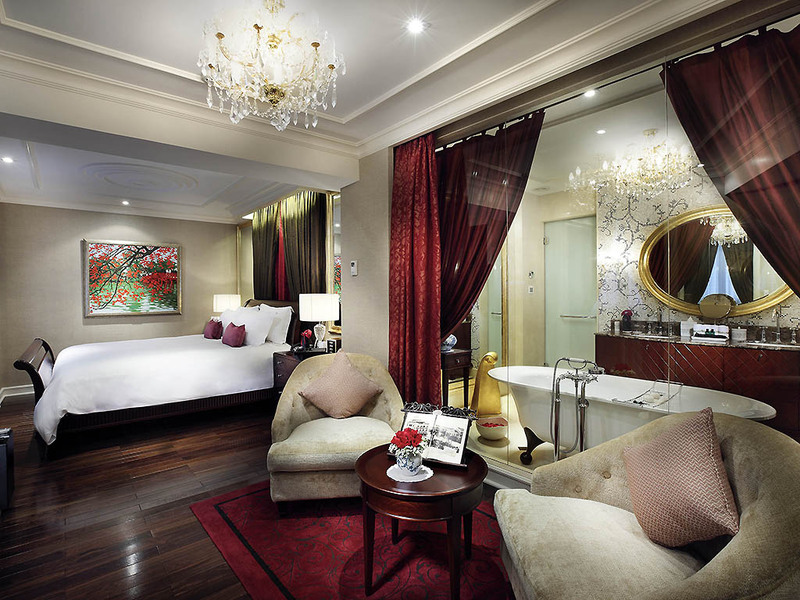 Luxuriate in legendary style in the grand suites of Sofitel Legend Metropole Hanoï. 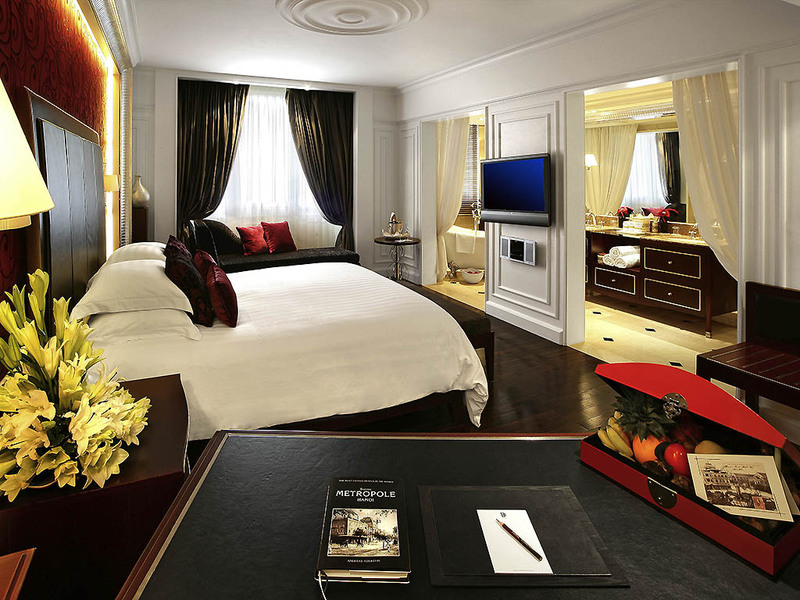 All suites lavish guests with historic elegance and 24 butler service. For a brush with greatness stay in the Somerset Maugham Charlie Chaplin or Graham Greene Suites. 32m²/344 sq. ft., Premium Room, Lofty & Bright interiors, Elegantly finished timber floors, Contemporary bathroom, 48" TV, Complimentary WIFI, Rollaway bed not available. 48m², 517sq.ft., contemporary interior with an open-plan design. Club Metropole privileges include butler service, internet, breakfast, afternoon tea, cocktails, late check-out on availability upon check-in. Rollaway bed on request with surcharge. 32m², 344sq.ft., natural wooden flooring, flat screen TV with complimentary internet access and non-smoking. Rollaway bed not available. 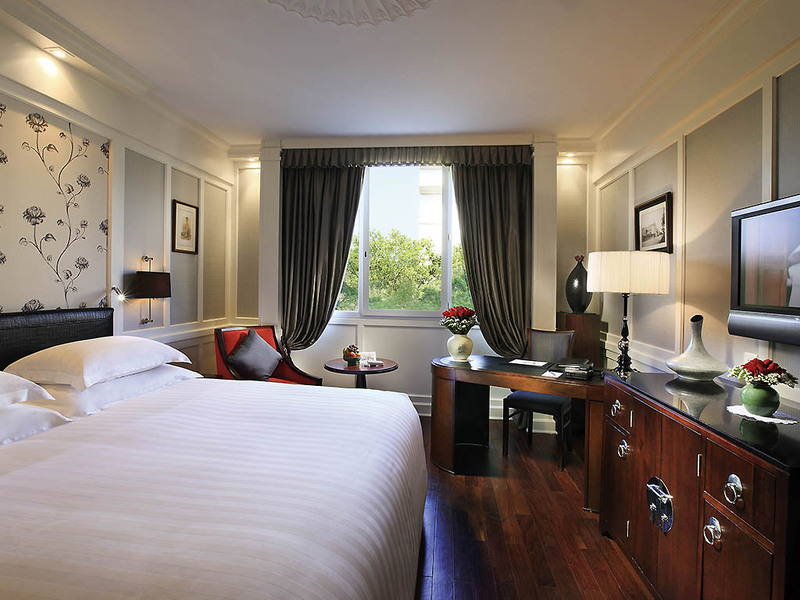 Luxury Rooms showcase a richly cultured interior décor that is distinctive of 1920s France. 37m², 398 sq.ft., French classical architecture, natural wooden floors, spacious bathroom with separate standing shower, flat screen TV with complimentary internet access and non-smoking. Rollaway bed available on request with surcharge. 64m2, 689ft2, wooden floor, bathroom with standing shower, Club Metropole privileges include 24-hour butler service, internet, breakfast, afternoon tea, cocktails, late check-out on availability upon check-in. Rollaway bed on request with surcharge. 176m², offers a residential modern luxurious style (with private spa therapy room). Continuing to accommodate high profile and celebrity guests from around the world, this suite can become a two bedroom on request (rooms charged separately). Named for the author of The Quiet American, this suite is the most beautiful suite in the historical wing with standing balconies overlooking Con Coc Park. Graham Greene stayed at the Metropole in 1951 to report for the Paris Match. Named for Somerset Maugham who stayed at the hotel in 1923 to write The Gentleman in the Parlour. Located in the historic wing, this 70 sqm Suite, complimented by a 72 sqm private garden, is ideal for guests who desire both elegance and outdoor living. Guests staying in the legendary luxury accommodation of the hotel's club Grand Premium Rooms and Suites revel in a wealth of exclusive privileges including 24 hour personalised butler service and access to Club Metropole executive lounge. Club guests enjoy colonial elegance and charming views of Hanoi through the lounges Art Deco windows as they enjoy private breakfasts afternoon tea and evening cocktails. Selected benefits include express check in late check out and complimentary WIFI. Savour legendary cuisine in Hanoi's most celebrated restaurants. Le Beaulieu lavishes the palate with French haute cuisine and the sommelier's fine wine pairings. Taste authentic Vietnamese in the Spices Garden and modern Italian culinary art at Angelina. Delight in the most storied bars of Hanoi's French Quarter. Sip sumptuous cocktails in the casual elegance of the Bamboo Bar with drinks named for famous guests. Revel in grands crus at Le Club. Experience the Parisian sidewalk cafe style of La Terrasse. Inspired by Paris-style gourmet shops, L'Epicerie du Metropole offers a French conventional ambience, with a delicious selection of French patisseries as well as imported meats, canned specialties and a wine & cheese selection. angelina, Hanoi's bespoke cocktail bar, whisky lounge & restaurant, is where the very best from Europe and the New World comes in perfect measure. The kitchen serves rustic comfort food, melding the finest ingredients in seasonal dishes. The friendly atmosphere of this contemporary haute brasserie where patrons come to savour the best and most authentic French cuisine in Vietnam. Le Beaulieu has been well-known for over a century as the venue of dazzling soirées and sublime Sunday Brunch. Enjoy ice-cream, fruit juices and exclusive Metropole tea collection, aromatic coffee or light snacks complimented with exquisite cocktails in the tranquil poolside venue of the peaceful courtyard. At La Terrasse, inspired by famous Parisian cafés, patrons are immersed into the heart of Hanoi. Observe the romance of local couples having their wedding photos taken, relax to the music of our saxophonist on Thursday, Friday and Saturday evenings. Overlooking the hotel's serene courtyard garden, this airy venue offers Hanoi's legendary cocktail lounge experience. In addition to the scrumptious menu, Le Club features a delectable chocolate buffet and jazz performance everyday (except Monday). Sofitel Legend Metropole Hanoï has long been the city's favourite venue for a stylish event. 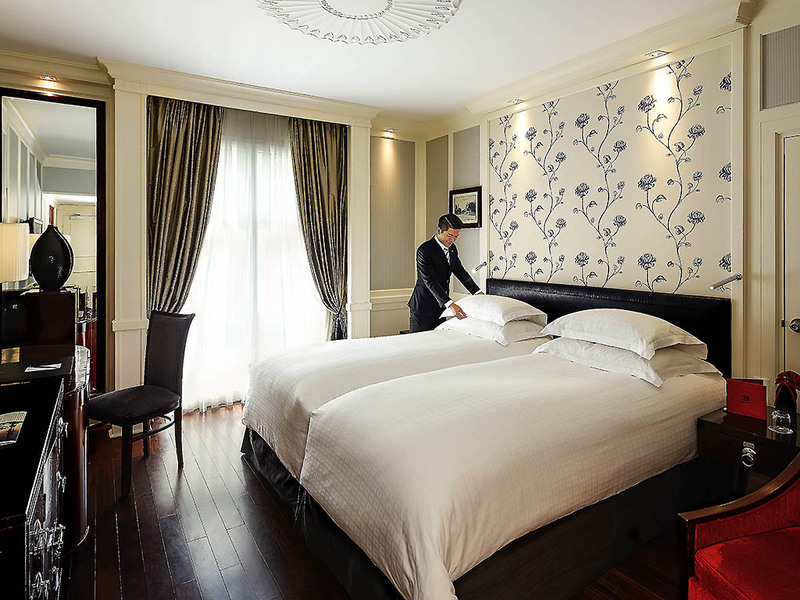 Generations of staff have carried on the refined tradition of hosting Hanoi's most legendary affairs - set amidst elegance, brought to life with precision. The team of event planners and Legendary Event Concierges will be more than happy to guide you through a vast array of options - event venues, seating arrangements, lighting, sound, scent, décor, presentation technologies, catering and more. Explore a rich banquet of possibilities from theme parties to elegant cocktails, luxurious launch events, gala dinners and international conferences. Our team also gladly arrange bespoke events at famed venues like the Opera House or Temple of Literature. 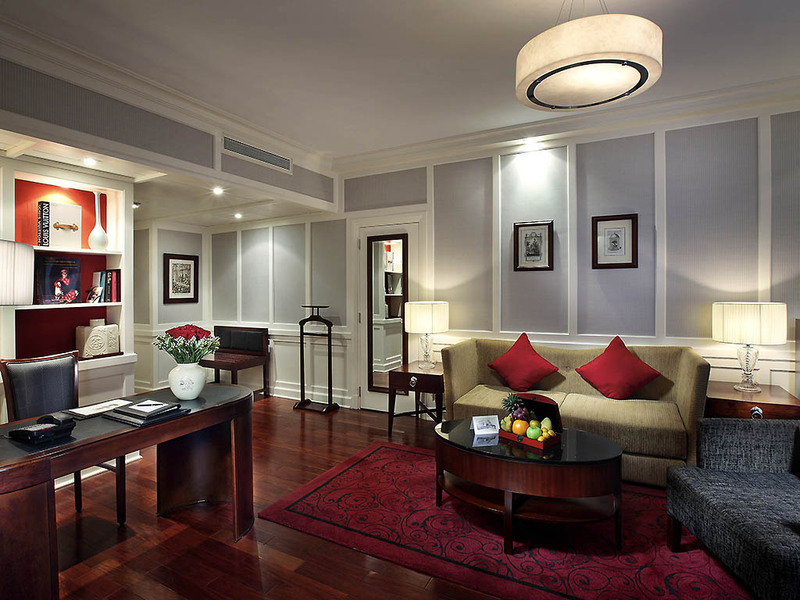 Since 1901 Sofitel Legend Metropole Hanoi has been inscribing love stories into the pages of history. Join over a century of romance in a Hanoi wedding venue that blends French savoir faire with gracious Vietnamese tradition. A stately European glass house, a hall graced with glittering chandeliers, a rooftop garden - select from a number of romantic wedding venues both within the historic hotel and even landmarks throughout the city. Sofitel's unparalleled chefs weave culinary magic in a superb tapestry of flavours - delicate artistry, enticing aromas, inspired flourishes, subtle balances of elements. Commission a masterpiece banquet or reception to your personal specifications. Sofitel's LegendaryWedding Planner is part artist, part visionary, part confidante. Together you create a wedding to reflect your desires, customising each detail with imagination. Add your special touches to a legendary backdrop of colonial elegance. Take your vows at our romantic rooftop balcony and enjoy the most special moments of a lifetime in the French elegance and old world charm of Sofitel Legend Metropole Hanoi. 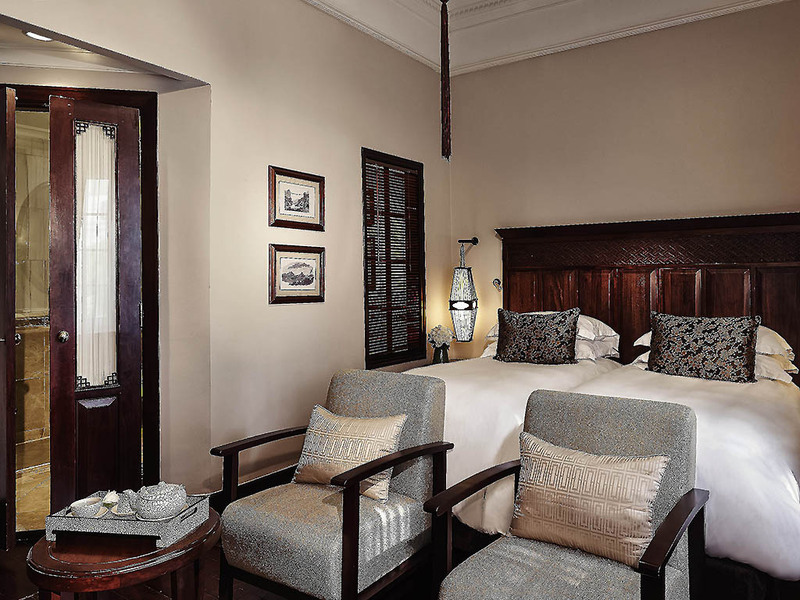 Honeymoon in a luxurious suite, imbued with heritage and the character of over a century of refined hospitality. The hotel accommodates bridal parties and wedding guests in 364 immaculate rooms and suites. 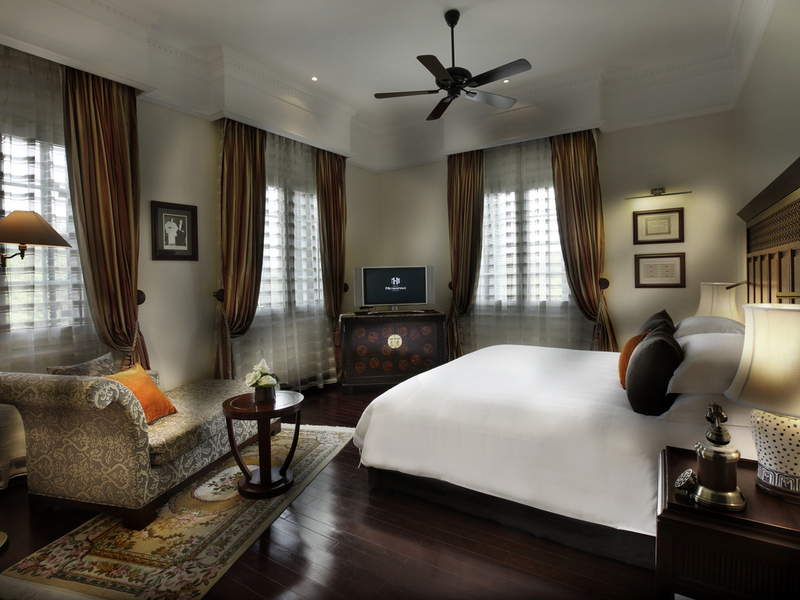 Sofitel Legend Metropole Hanoi is located in the picturesque French Quarter. 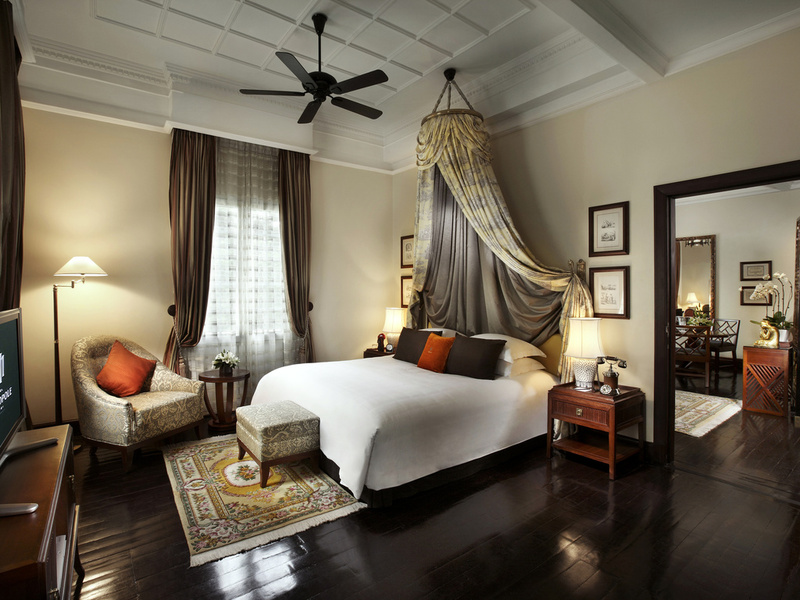 Your wedding guests enjoy one of Hanoi's most charming districts, with the Old Quarter just a few minutes' walk north. The Opera House and Hoan Kiem Lake are mere steps away. Partake in our romantic honeymoon packages that include dinner for two at Le Beaulieu restaurant, in room amenities including a flower bouquet, homemade chocolates and a special breakfast in bed. Packages including room upgrades are also available. 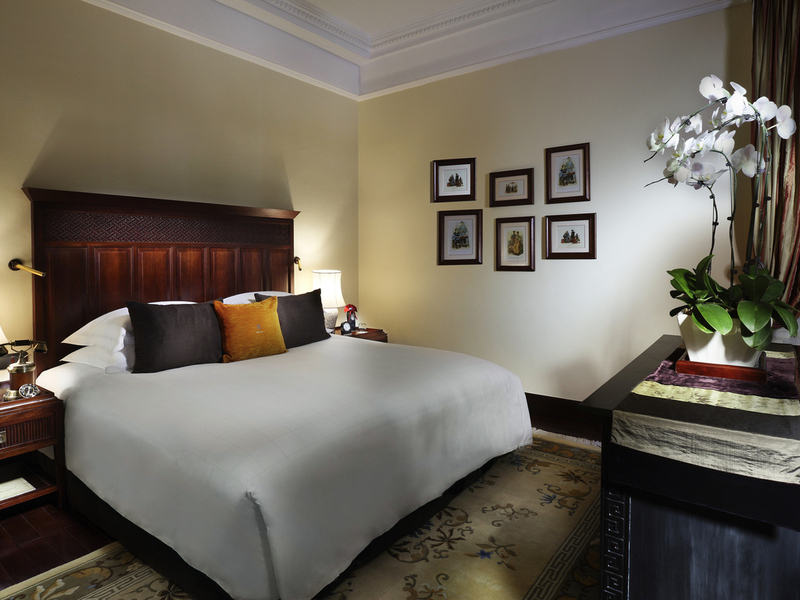 Guests staying at Sofitel Legend Metropole Hanoi enjoy a full range of 5-star luxury hotel services and facilities, including the swimming pool and fitness area, hair dresser, hotel gift shop, luxury boutique arcade and our unique Path of History tour. We provide a state of the art transportation service with a fleet of BMW 7 series automobiles for airport transfers or personal needs. The experience of yesteryear can also be lived with an amazing adventure in the 1950's Metropole Citroen Traction. 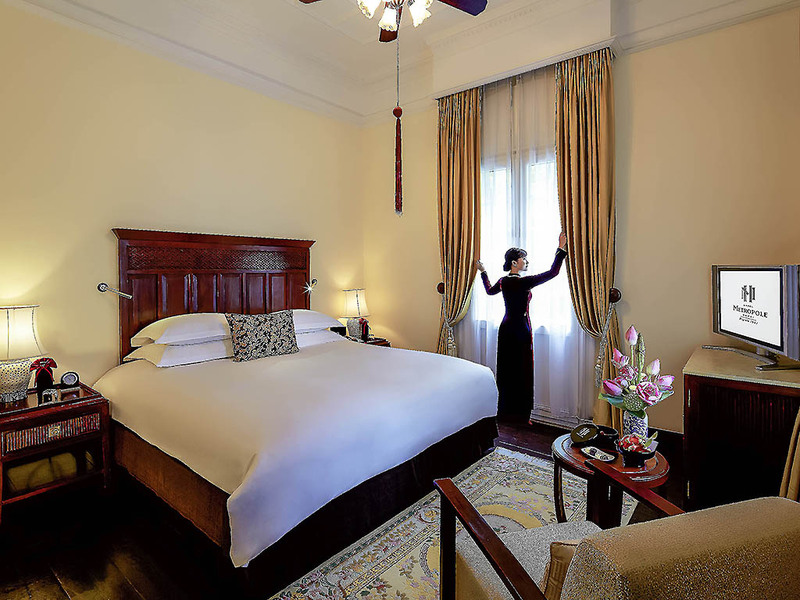 Tucked away in a private oasis at the heart of Hanoi, the hotel's stately swimming pool offers carefree relaxation in sophisticated surrounds. A finely equipped fitness centre invites for a brisk workout on state of the art equipment.